For the year ending December 2017, compensation costs for private industry workers rose 2.6 percent. Wages and salaries, which make up about 70 percent of compensation costs, increased 2.8 percent over that period. 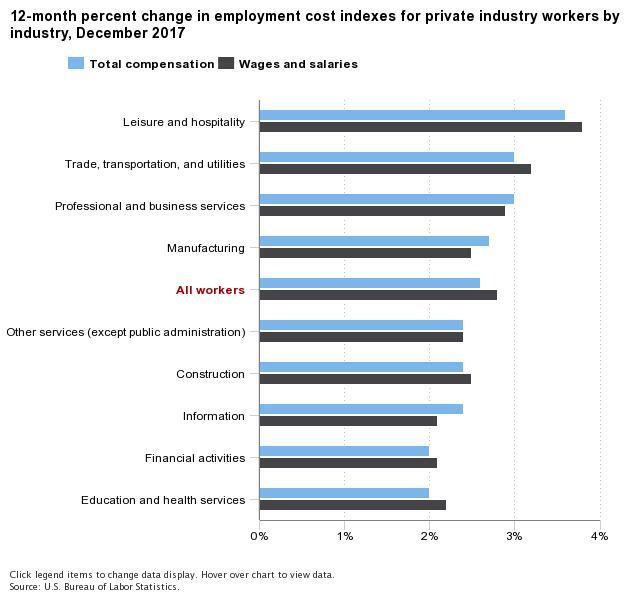 For workers in the leisure and hospitality industry, compensation costs rose 3.6 percent over the year, the largest increase among private industries. Wages and salaries for leisure and hospitality workers increased 3.8 percent over that period, also the largest increase among private industries. From December 2016 to December 2017, other industries with compensation costs that increased 3.0 percent or more were trade, transportation, and utilities, and professional and business services (3.0 percent each). The industries with the lowest over-the-year percentage increases in compensation costs for December 2017 were education and health services and financial activities (2.0 percent each). Information and financial activities had the lowest over-the-year increase in wages and salaries for the year ending December 2017, at 2.1 percent each. These data are from the Employment Cost Trends program and are not seasonally adjusted.